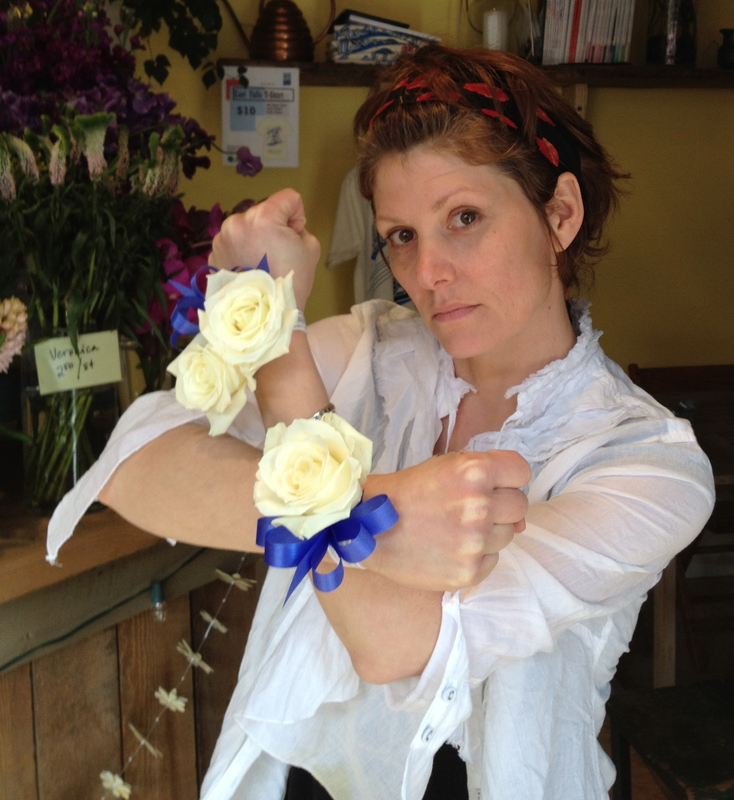 At falls flowers this week, I got a lesson in making wrist corsages. 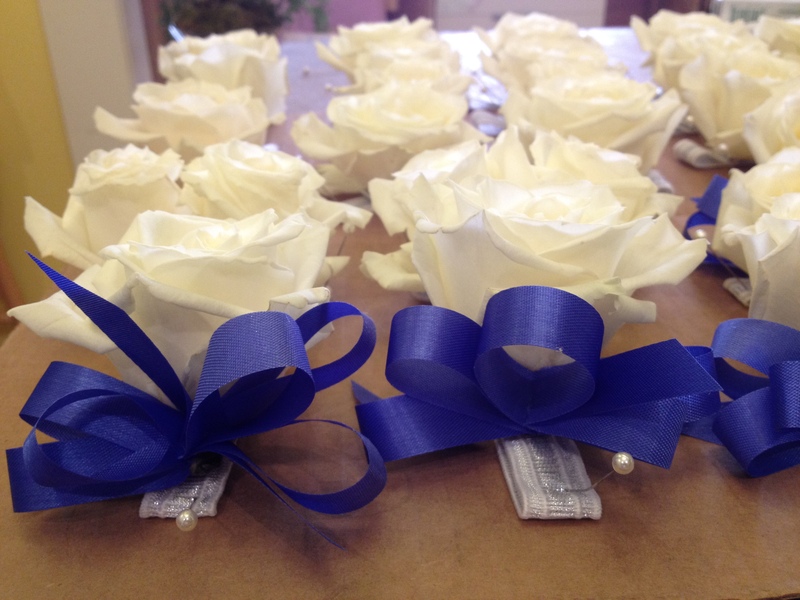 There are a few different styles and ways of doing it, but as the request was for almost 40 simple white roses for a sorority gathering, we went with the simplest and fastest method – GLUE. Gluing saves time when you have a bulk order, because the alternative is wiring and taping – a lesson I hope to get one day, too. And this glue is like no other I’ve worked with – Oasis Florist Adhesive. It’s a “fast-drying and waterproof liquid adhesive formulated for use with fresh flowers.” It won’t brown fresh flower petals, and it will hold up in cold storage. In other words, it’s a must-have for all you budding floral designers out there! 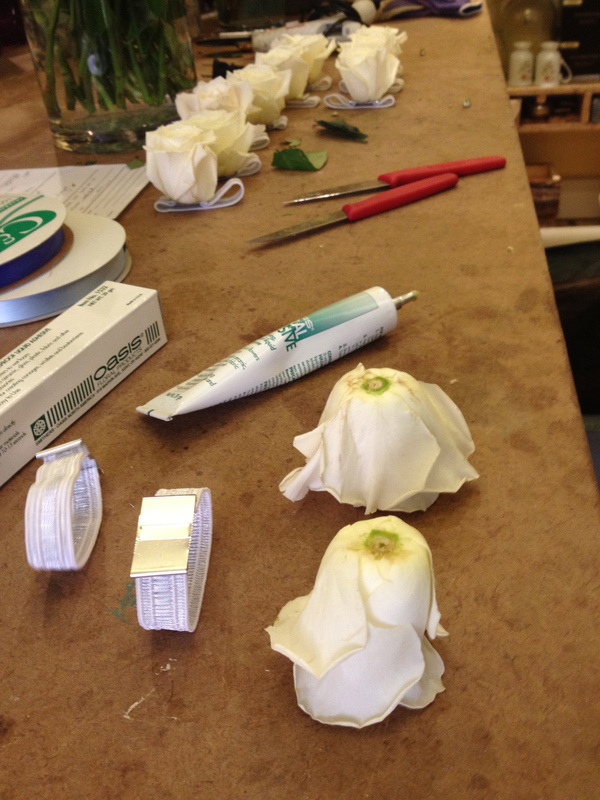 In making the wrist corsages, Peicha and I start by using well-hydrated roses, removing their sepals (the small spiky leaves at the base) and then trimming the stem down to near nothingness. Shave the stem down with a knife so it’s as flat as possible. Add a tiny blob of glue to both the bottom of the rose and the Elastic Wrist Corsage Band, making sure to spread the glue evenly. Let the glue set for about 30 seconds and then carefully press the rose onto the band’s flat metal plate. Earlier, we removed the little metal prongs that would normally fold over and enclose a bunch of wired flowers. As with any glue, it’s better not to touch it with your fingers or you’ll be trying to get it off all day – this is especially true with this glue, though scrubbing with Lava soap does get it off pretty well. Also – when working with this glue PLEASE choose a well-ventilated spot and take breaks to venture out into the fresh air or you will get silly like I did. As far as wrist corsages go, I think there are a lot of possibilities out there on what you could do, and I think they are a great alternative for prom season. Remember your date awkwardly trying to pin a corsage on your chest? This is so much easier. And a wrist corsage doesn’t get in the way during the slow dance! I really think we should all wear flowers a little more often, don’t you? This entry was posted in East Falls, Floral Design, Flowers, Wearable Flowers, Wedding Flowers and tagged Falls Flowers, floral glue, oasis floral adhesive, Peicha Chang, prom season, white roses, wrist corsages by Ann. Bookmark the permalink.